Carlo Crocco grew up in a family of watchmakers in Italy and in 1980 defied convention by creating a solid gold Hublot fitted with the first black strap in natural rubber and a sensation was born. The brand has many successes in the 1980s but when watch industry genius Jean Claude Biver joined the firm in 2004 a phenomena was born. The Big Bang series of watches have become one of the hottest watches in the world and demand so far outstrips supply that numerous models sell at a premium above retail when they can be found at all. 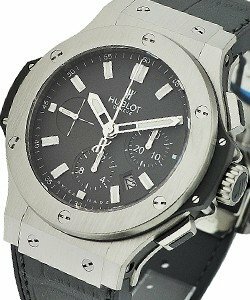 There is no denying that Hublot Big Bang Watches have become one of the most popular luxury watch choices for fashionable modern men with active lifestyles. Available for both men and women, is the Hublot 'Classic'. Available in sizes 24mm, 28mm, 32mm, 36mm and 38mm, the Hublot 'Classic' is available in steel and gold on Rubber band with plain or diamond bezels, and a few different dial colors. 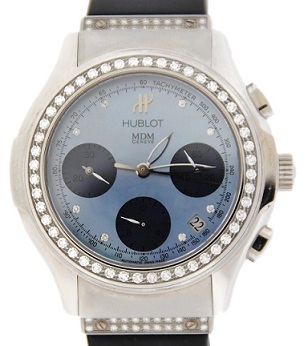 The Hublot 'Elegant' Series is also a good consideration for those seeking a classic, but fashionable piece. Popular too, is the Hublot 'Classic Men's Chronograph' is also available with diamond bezel, as well as with a Tachymeter scale bezel. And great for trendsetting ladies, Hublot's 2 Rows Diamond Bezel pieces are a stunning combination of ceramic, steel, diamonds, and rubber, and look great on ladies as well as men. The Hublot 'Bigger Bang Tourbillon' is an extraordinary fusion of style and complication. Beautiful to look at, and extremely functional with its Tourbillon and chronograph, the Hublot 'Bigger Bang Tourbillon' comes in a combination of gold, ceramic, and rubber . Looking for extra protection in the water. The Hublot 'Super B Chronograph' in Steel includes a tachymeter, luminescent index hour markers and hands, and is water resistant up to 100 meters. 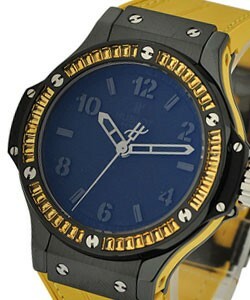 Hublot's 41mm Big Bang with Ceramic Bezel is a highly sought after piece. The combination of black carbon fiber, and rose gold Arabic numerals and indexes makes this an incredibly versatile, fashionable watch. The Hublot 'Classic Regulateur' in Steel luxury sport watch that follows this tradition. The black dial is unique with three separate displays for time. The giant Hublot 'Gold King Power Foudroyante Chronograph' is not just for large men. This piece looks great on men who are hip, casual and active and who like something a little 'different'. 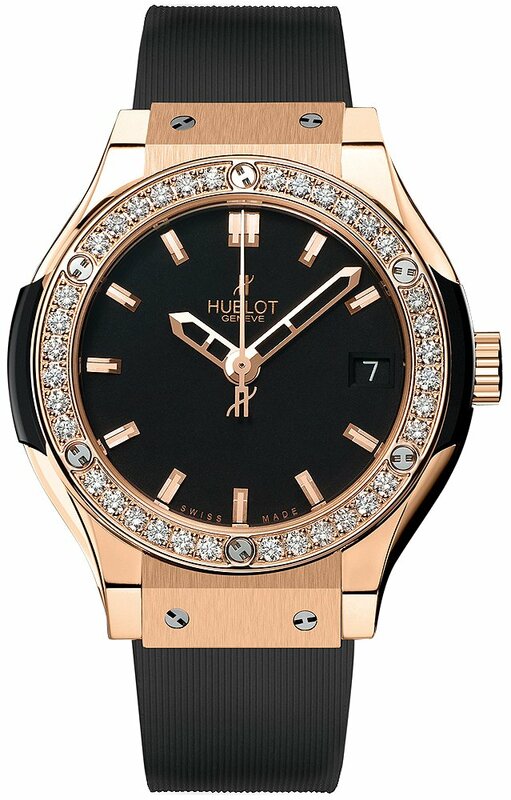 Like many of Hublot's Watches, this is especially popular in rose gold. Another extra special Hublot Big Bang is the 'Aero Bang Tungsten', with black skeleton dial, this dial allows the wearer to see the intricate workings of this obviously masculine, yet elegant watch. If looking for something mid-sized, yet eye-catching, the 'Hublot 38mm Big Bang Black Ceramic' 2 Rows Diamond Bezel' includes 126 diamonds carried on Hublot's classic black rubber bracelet. 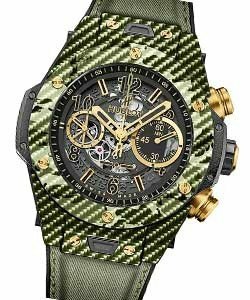 The popularity of Hublot 'Big Bang' Watches has kept the Hublot brand bringing out extremely sought after Limited Edition 'Big Bang' Watches, these include: the gorgeous diamond bezel 'Big Bang Portocervo', The 'Black Ceramic Big Bang St. Barth', The Big Bang 'Federacion Mexican de Futbol', The Iced out 'Big Bang Artic Camouflage', Hublot's 'Commando Bang', The incredibly clean and modern-looking 'Big Bang Diego Maradona Limited Edition', The Left Hand 'Project F Bang - F1 Singapore', the 'Split Second Ice Bang', Hublot's 'Polo Gold Cup Gstaad' , the 'Manchestor United Red Devil' Big Bang, the 'Aryton Senna 2', the 'Luna Rossa', The 'Spanish Football League Big Bang', 'Big Bang - Swiss Football Association LE', 'The Big Bang Cappucino', 'Hublot's Big Bang Chocolate', the Big Bang 'Formula 1 Istanbul Edition', 'Big Bang St. Moritz', The 'Big Bang Courchevel Yacht Club', The 'Big Bang Black Magic Diamonds'.. the list goes on.